The Journal of Educational, Cultural and Psychological Studies aims to be an inclusive central repository for high quality research reports, reviews, theoretical and empirical articles. 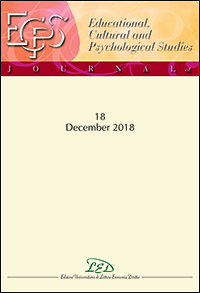 The Journal serves as an interdisciplinary forum for theoretical and empirical studies of pedagogical, psychological, historical and sociological issues. As well as research reports, the Journal publishes theoretical and review articles. Research reports are quantitative or qualitative depending upon the methods employed by the researcher. All articles are addressed to a research audience, to teachers and trainers working in schools and in vocational training, and to scholars in allied disciplines in all the human sciences.